When I was a kid and would get dragged to the mall by my parents, I would always gravitate to stores like Sharper Image. These gadget-stuffed stores probably never actually got a sale out of me, but they were stuffed to the gills with impractical and expensive gadgets for me to ogle, and there was generally an expensive, ultimately-uncomfortable massage chair near the entrance that lured me in every time. 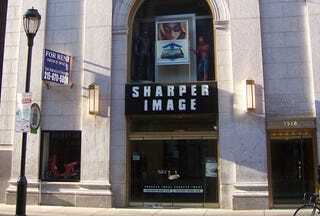 Sadly (I guess), it's now the end of an era: Sharper Image has filed for bankruptcy.